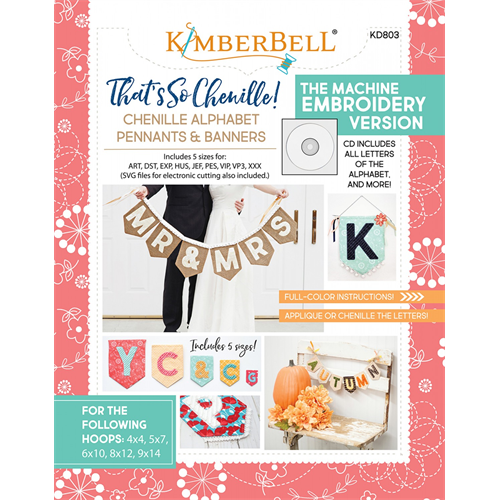 Kimberbell’s chenille alphabet pennants are Cute with a capital C!! We’ve covered all the letters A through Z, plus exclamation point, hashtag, and ampersand symbols (! # &). 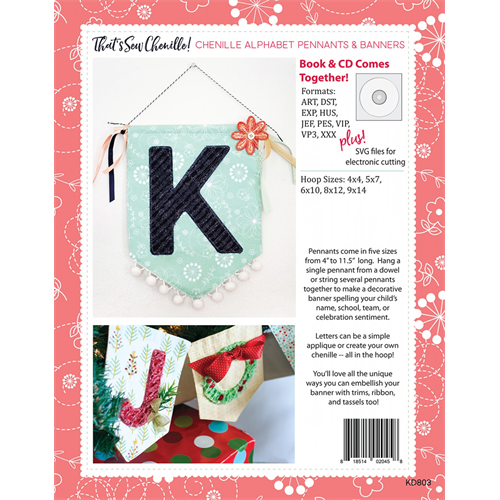 Individual letters are appliquéd on the pennant design with a decorative outline stitch, then layers of fabric are tacked in place ready to chenille. Pennants are made in-the-hoop in five sizes beginning with 4×4 up to 9×14. For an appliqué only option, simply skip the chenille step on your machine and finish the pennant as directed. 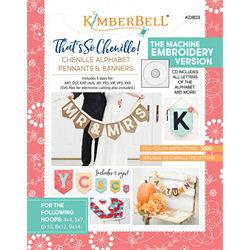 String several pennants together to make a decorative banner spelling your child’s name, school, team, or celebration sentiment. Pennants range from 4 to 11 1/2" long. Book is in a full-color format.